Many different styles of kachinas exist to provide different types of examples and guidance for the tribe. Each type has a particular set of characteristics, and a distinctive personality. When impersonated, a costume, song style, and set of body movements are both repeated and unique. Most kachinas are considered benevolent friends, although some are clowns and still others punish wayward people. Other Kachinas – Other kachina groups can include plants, whippers, hunters and kachinas borrowed from other pueblos. Ahol Mana – A maiden spirit, she arrives with Ahola during the Powamu ceremony and with him, she visits various kivas and ceremonial houses. On these visits she carries a tray with various kinds of seeds. Aholi – The Chief Kachina’s (Eototo) lieutenant, he helps the chief bring moisture to the villages. Aholi Kachina is a beautiful doll that usually appears with a tall blue helmet and a colorful cloak consisting of colors that represents the flowers and the essence of summer and the likeness of Muyingwa, the Germ God. A patron of the Hopi Pikya clan, Aholi once allowed his throat to be slit so that Eototo could escape. Ahola – Also known as Ahul this Hopi kachina, embodied by a man, is one of the important chief kachinas for the First and Second Mesas because he opens the mid-winter Powamu ceremony, sometimes called the bean planting festival. On the first night of the festival, he performs inside a kiva before going with the Powamu Chief to give prayer feathers to Kachina Spring at dawn. Afterwards, he and the Powamu Chief visit all of the kivas and ceremonial houses, giving out bean and corn plants and marking the doorways with stripes of cornmeal. At the end of the ceremony, Ahola descends to a shrine, bows four times to the Sun, and asks for health, happiness, long life, and good crops. Ahola is also the friend of Eototo (Aholi) and one legend tells of Ahola having his throat cut to let Eototo to escape. Ahulani – This figure participates in the the Soyal Ceremony appearing with two Soyal Manas on the morning of the last day of the event. The decoration of the Ahulani mask differs in its symbolism on alternate years, according to whether the Snake or Flute Dance is celebrated. Ahulani carries under his left arm several ears of corn and spruce boughs or twigs. In his left hand he bears a chief’s badge and skin pouch with a sacred meal, while in his right, he carries a staff. 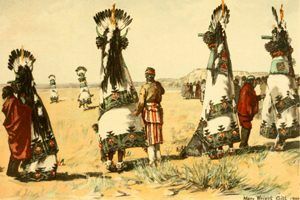 In the image at right, Ahulani is escorted by two Soyal Mana kachinas, which differ only in the color of corn which they carry; one has yellow, the other blue corn. Antelope – Known as Chop or Sowi-ing this kachina dances to increase its numbers and brings rain. There are many similarities between this spirit and the Deer Kachina, but they can be differentiated by the deer’s antlers or the antelope’s horns. When he appears, he is often accompanied by the Mountain Sheep Kachina, and the Wolf Kachina. Apache Dancer – Known as Yoche this spirit is mainly seen during the Kiva Dances. Also called the “Mountain God”, he protects the Apache tribe in war time and will appear in the coming of age ceremonies for young girls. Badger – Called Hototo, this kachina has many roles including guard, gift bearer, and warrior, and plays important part, as animals are teachers, advisors, and doctors. The preparer of food and the most respected of the war kachinas. He is mainly seen during the Bean and Mixed Kachina Dances. Bean – Dances for a plentiful crop of beans. Bear – Also called Hon, the Bear Kachinas are very powerful, capable of curing bad illnesses, and are great warriors. They are frequently distinguished only by color, such as white, black, blue, or yellow. The bear dances as a watchman or side dancer during the Soyal Dance and he sings while dancing outside the lines during the Mixed Dance. His most distinctive feature is the presence of a bear footprint on both cheeks. Black Crow Dancer/Raven – A warrior whose main purpose is to make war on the Clown kachinas and to warn anyone else who does not behave. 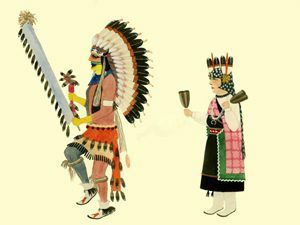 Blue Ahote – The Ahote Kachina also is seen to come Plains Indian influence, mainly due to the wearing of a long eagle feather headdress.